The steady decline in jobless claims signals that companies are laying off fewer and fewer workers. 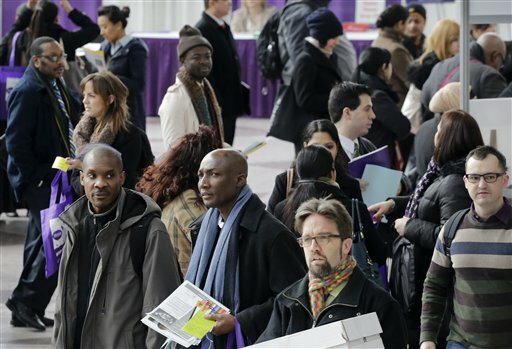 WASHINGTON – Fewer Americans sought unemployment aid last week, reducing the average number of weekly applications last month to a five-year low. The drop shows that fewer layoffs are strengthening the job market. The Labor Department said Thursday that applications fell 10,000 to a seasonally adjusted 332,000. That reduced the four-week average to 346,750, the lowest since the week of March 8, 2008, three months after the Great Recession began. The report “provides further evidence of a gradual strengthening in labor market conditions,” Paul Dales, senior U.S. economist at Capital Economics, said in a note to clients. Applications for unemployment aid are a proxy for layoffs, and their steady decline signals that companies are laying off fewer and fewer workers. It suggests that companies aren’t worried that business might fall off in the near future. The number of applications for benefits has dropped five times in the past six weeks and has declined 13 percent since mid-November. At the same time, net hiring has picked up. Employers added an average of 200,000 jobs a month from November through February — up from about 150,000 a month in the previous four months. And the unemployment rate reached a four-year low of 7.7 percent in February. During the Great Recession, layoffs spiked and applications for unemployment benefits peaked at 667,000 in the week that ended March 28, 2009. In a healthy economy, applications usually fluctuate between 300,000 and 350,000. Applications may pick up in coming weeks, though, as across-the-board government spending cuts force many federal agencies and government contractors to lay off or furlough workers. The spending cuts, which took effect March 1, were mandated by a budget deal. The White House and Congress haven’t been able to reach a deal to reverse them. Bricklin Dwyer, an economist at BNP Paribas, estimated that the government spending cuts will boost applications for unemployment aid by about 15,000 a week in the second half of March and between 15,000 and 20,000 a week in April. Still, the economy should generate steady job gains this spring, Dwyer said, even if monthly job growth dips from February’s 236,000 increase. So far, employers haven’t been laying off more workers because of higher taxes or government spending cuts. In January, Social Security taxes rose 2 percentage points. Someone earning $50,000 has about $1,000 less to spend in 2013. A household with two high-paid workers has up to $4,500 less.